A low red blood cell count can be a sign of anemia, a condition in which the body does not have enough normal red blood cells and the blood is unable to carry enough oxygen to the tissues that need it. Many conditions can cause a low red blood cell count; these conditions either cause red blood cells to be lost outside the body, cause excessive destruction of red blood cells or cause decreased production of red blood cells. A low red blood cell count is usually detected by a common blood test: the CBC, or complete blood count. A red blood cell count is generally considered low if the number of red blood cells in the sample is less than 4.2 million to 5.4 million cells per microliter of blood (cells/mcL) in women and 4.7 million to 6.1 million cells/mcL in men, although these values may vary somewhat between different laboratories. The most common cause of red blood cell loss is bleeding. The bleeding can happen rapidly -- for example, in an acute hemorrhage caused by an injury. Excess blood loss from surgery, or even frequent blood draws over time, can also lead to a low red blood cell count -- sometimes an acute one. Bleeding can also happen chronically, over a longer period. Chronic red blood cell loss in women is often caused by heavy menstruation. Chronic blood loss can also occur when a lesion in the intestinal system, such as a benign polyp or malignant tumor, results in bleeding. 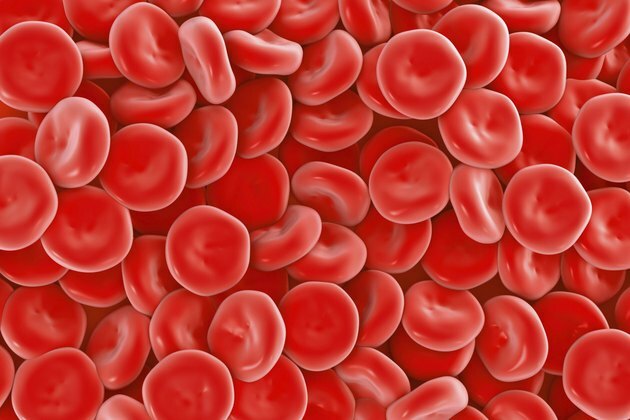 Red blood cells are produced in the bone marrow and circulate in the bloodstream for about 120 days. Old and damaged blood cells are normally removed by the spleen. A variety of diseases cause damage to red blood cells or cause normal red blood cells to be removed too early. Red blood cells can be fragmented when they pass through constricted or damaged blood vessels, or when passing over artificial heart valves, leading to their destruction and removal by the spleen. In blood disorders such as sickle cell anemia, the red blood cells that the body produces are abnormal and fragile and more prone to destruction. In a disorder called autoimmune hemolytic anemia, the immune system identifies normal red cells as foreign and attacks the cells with antibodies. Certain diseases, infections and drugs can damage or interfere with the cells in the bone marrow that produce mature red blood cells, leading to a low red blood cell count. Chemotherapy drugs, given to treat cancers either in the bone marrow or elsewhere in the body, can also harm the cells that produce mature red blood cells. In a condition called myelodysplasia, the cells that produce red blood cells grow and develop abnormally and produce fewer and more abnormal red blood cells. The bone marrow can also be involved by scarring, cancer or other abnormal cells, which replace the normal marrow cells and result in decreased production of red blood cells.